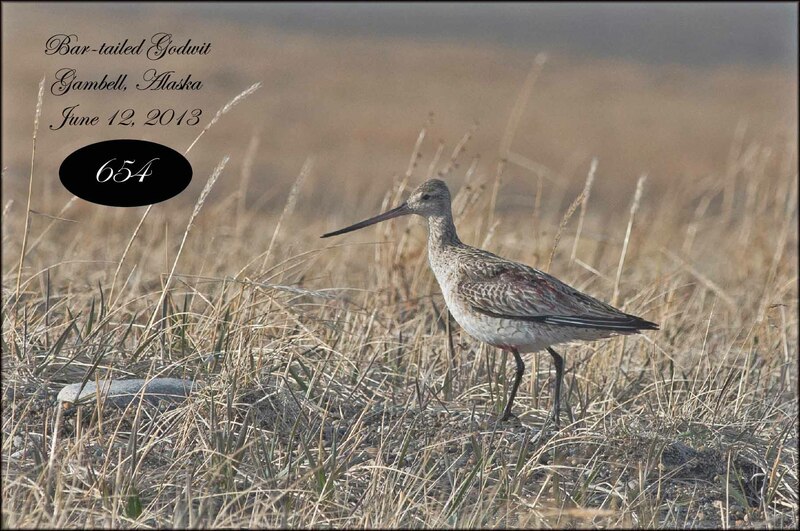 The minute I hit the ground in Gambell, I knew it was going to be an awesome birding experience. 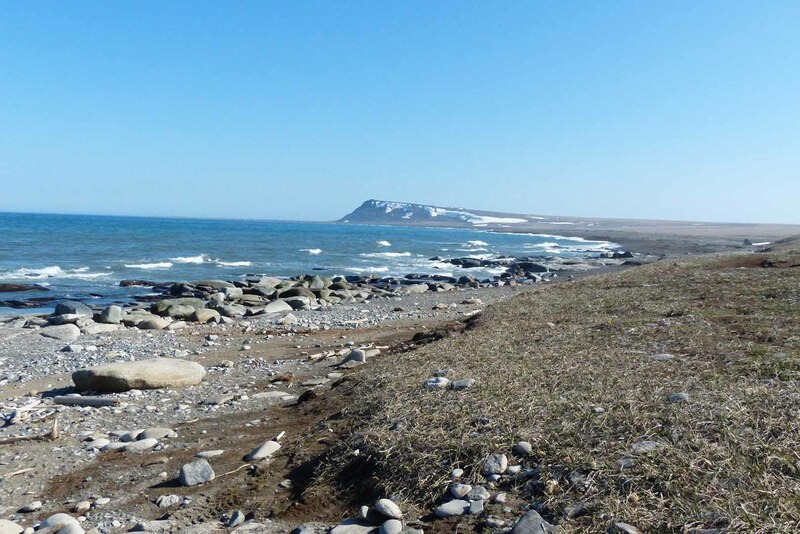 My adrenalin was flowing, finally we were in Gambell and the coast of Siberia had been visible on the way in. 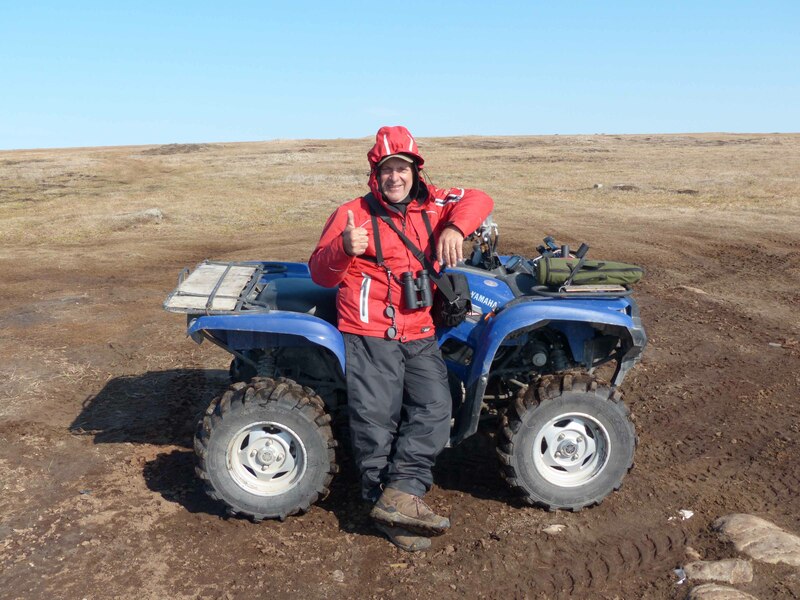 As we got off the airplane, we were greeted by Hansen Irrigoo, who loaded our suitcases and us, into an ATV for the ride to the Sivuqaq Inn, which would be our home for the next 9 days. 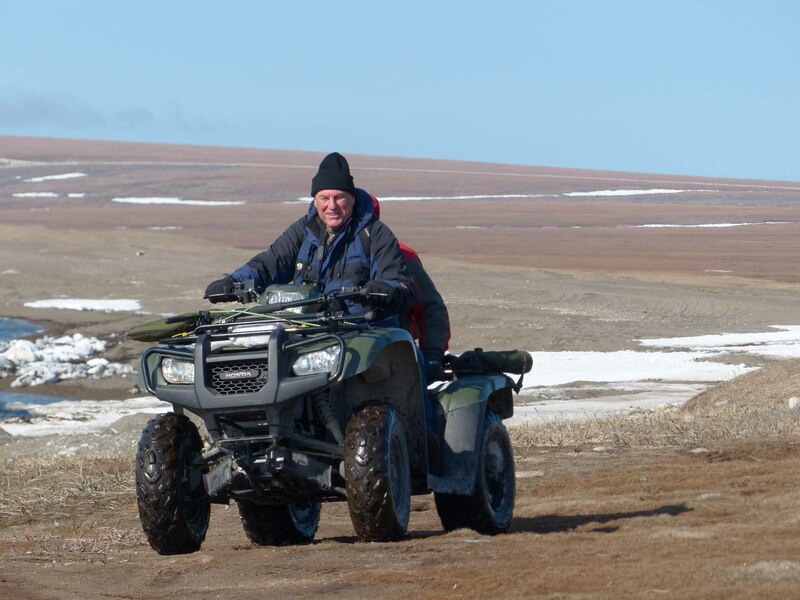 Hansen had arranged for a few locals who had ATV’s for rent to meet us at the Inn. Believe me it is nearly impossible to walk the required distance, to where the birds are. It’s doable but only for the very fit. You can get to the cliffs and Seawatch, but the 5 mile trip to the southern tip is a killer. Loose pea stone gravel is like walking in snow, you sink down every time you take a step and the areas we are allowed to roam are full of the stuff. Plan on spending 80$ a day on ATV rental and 5-10$ every other day on fuel (depending on how much you roam). I rented a Yamaha Grizzly from Quinn Slwooko at 907-985-2443, a very powerful and reliable machine. 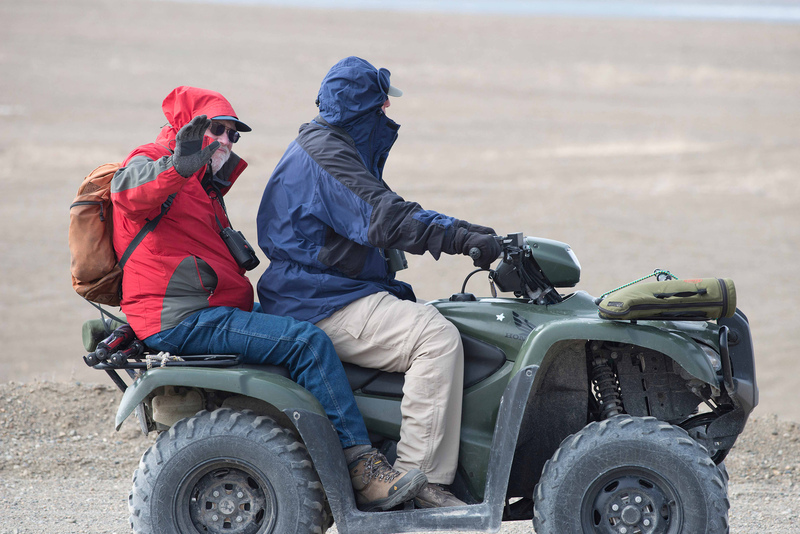 I had almost as much fun running around on the ATV as I did birding. LOLOLOL, I did say almost. Guides can be hired to take you further afield but we decided against it, the cost was out there. The YPIK people, are very friendly but like anywhere in the world, there are those, that do not like you trespassing on their land. I met many nice people, learned about local customs, foods and hunting techniques. Some of the best carvers in the north can be found on Gambell, so bring some extra money to buy local carvings. 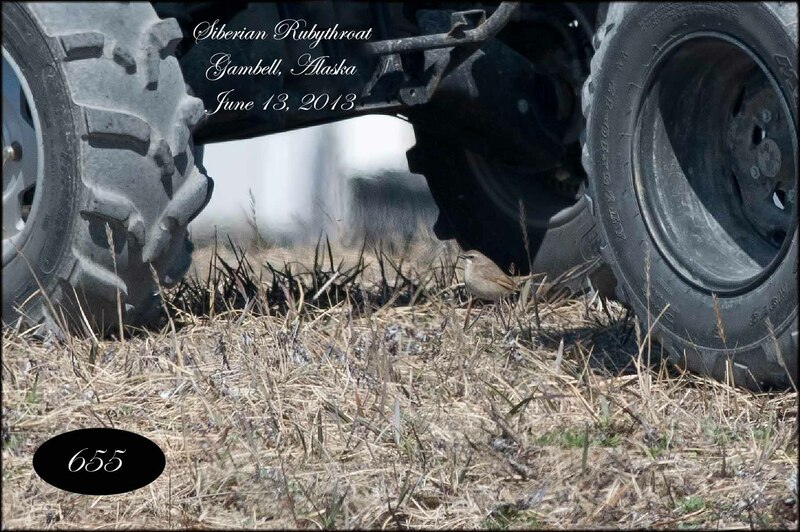 The people live on what they hunt and most food at grocery store come’s in by plane and can be expensive. Just to give you an idea a can of beans, we buy at our local supermarket for 89 cents, cost me 6$. 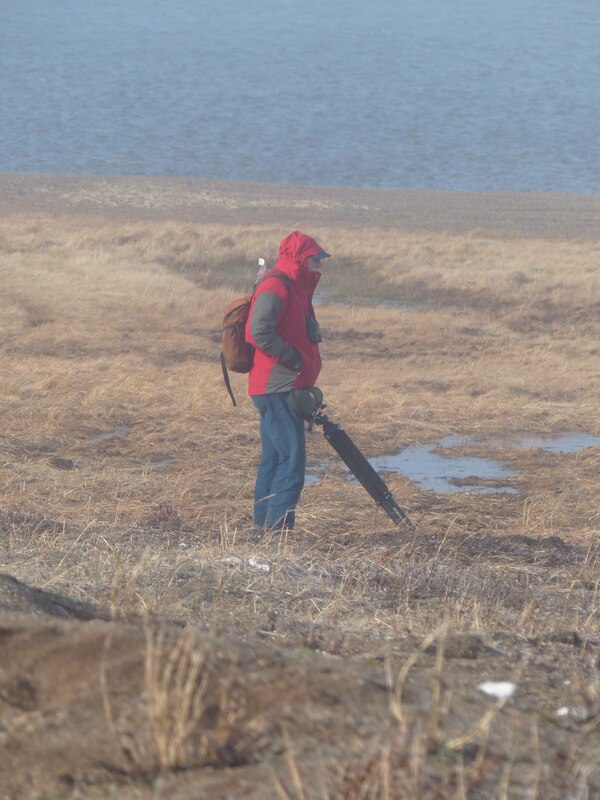 ERA airline, allows two 50 pound bags, so bring some food along from Nome, you’ll save a bit of money. Inside the inn, we were greeted by Cheryl Koonooka and Lisa Campbell, who set us up with travel permits (50$) and told us where we could and could not go. They set us up in our rooms and once settled off we went to explore. 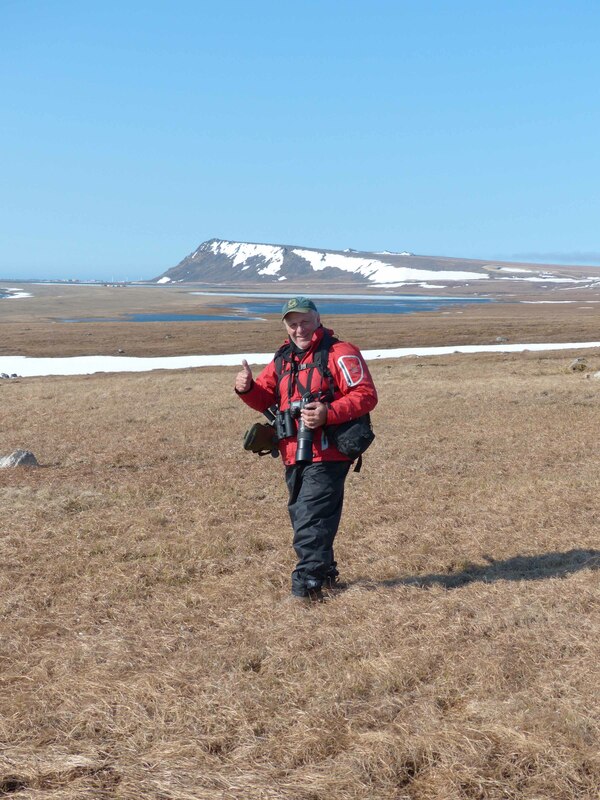 Within 45 minutes, Chris, Mike and I, were at seawatch, an area that’s perfect for viewing the hundreds of thousands of birds flying by, as they leave their nests in search of food, out in the Bering Sea. 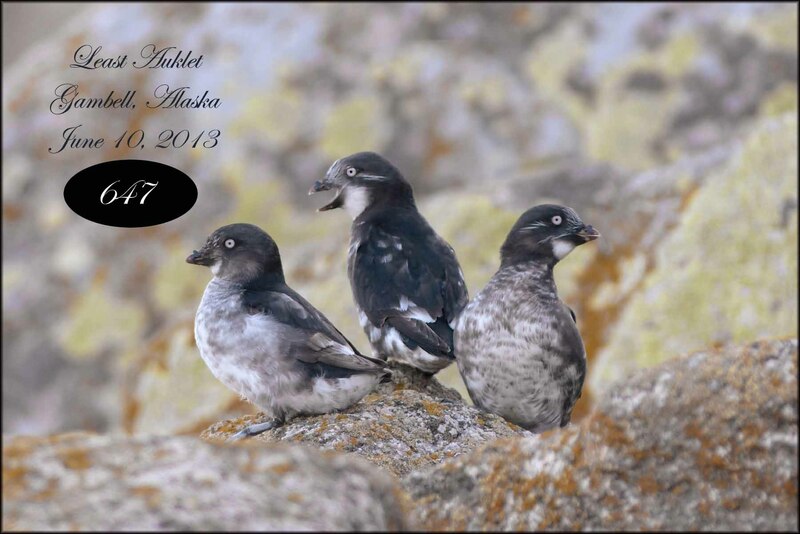 There were so many Least, Crested and Parakeet Auklets, the sky seemed black at times. 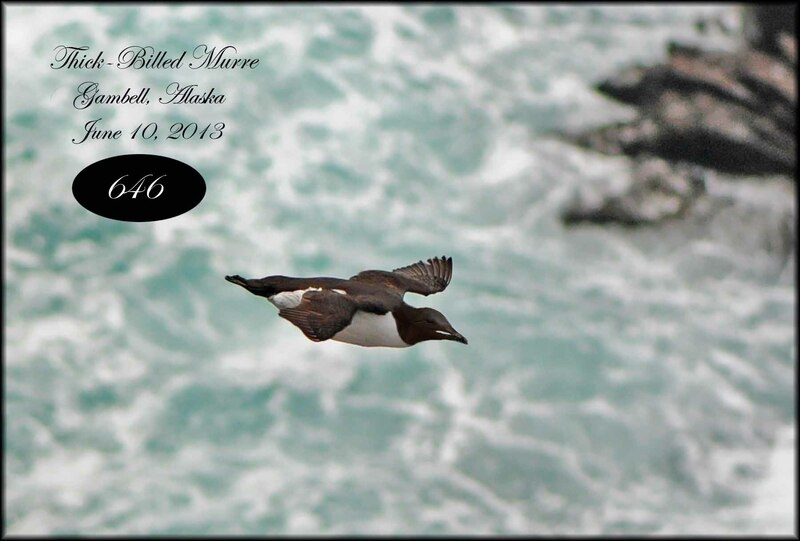 Common and Thick-billed Murre’s, flew by in formation by the thousands. Pigeon and Black Guillemot’s were common in the waters close to shore. Steller’s and Spectacled Eider’s are very rare at this time of year. This was a disappointment, as these were birds, I really wanted to see. Gray whales, were everywhere, we counted at least 10 one night, with some as close as 30 metres off shore. 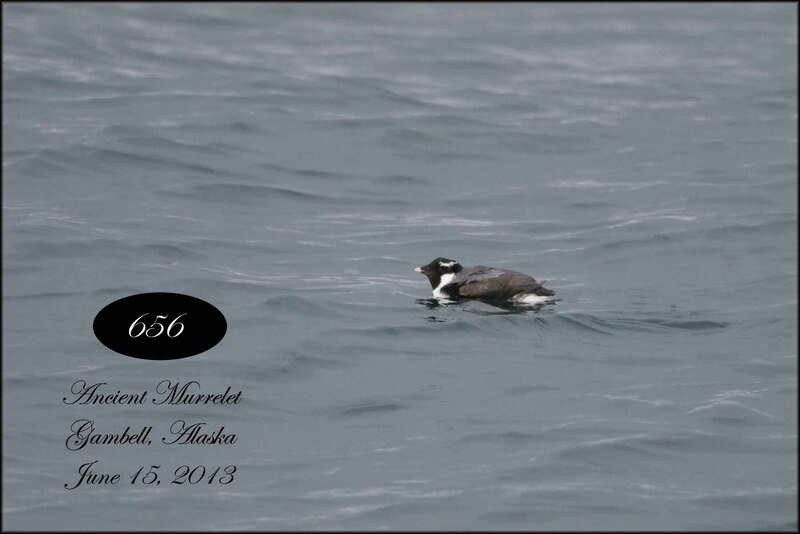 We returned to the seawatch every night, and got lucky with great views of an Ancient Murrelet feeding 20 feet off shore, a pleasant and unexpected surprise and a Yellow-billed Loon. 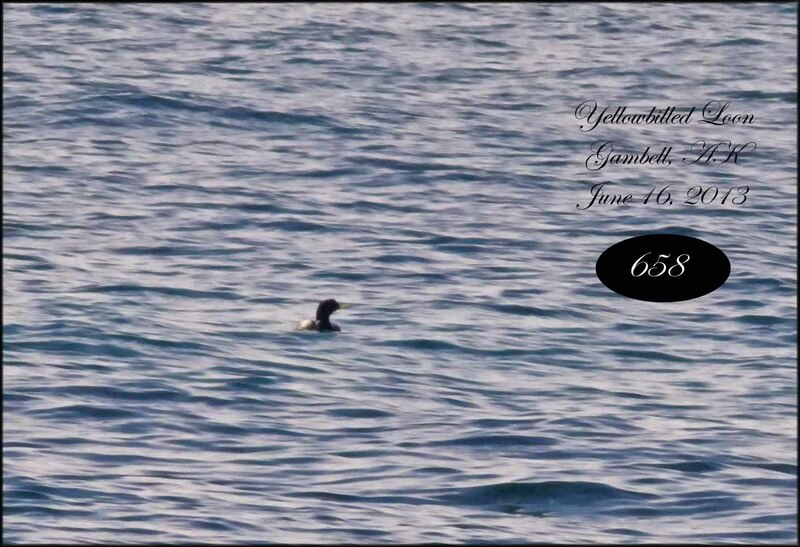 I was able to get a decent image of the murrelet but the loon, well let’s just say it takes lot of imagination, to know that’s what it is. It was getting fairly late that first night, although it never really gets dark at night at this time of the year. 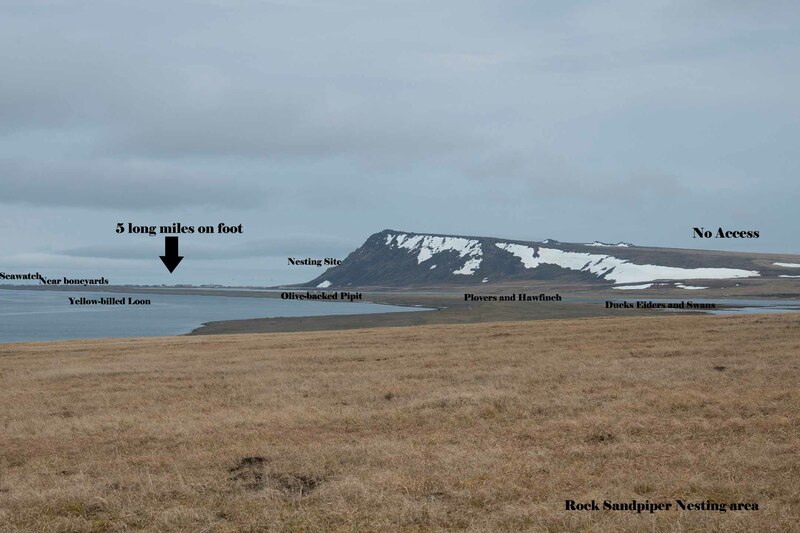 And we were all getting a little hungry, so we opted to visit the cliffs and look for seabirds. 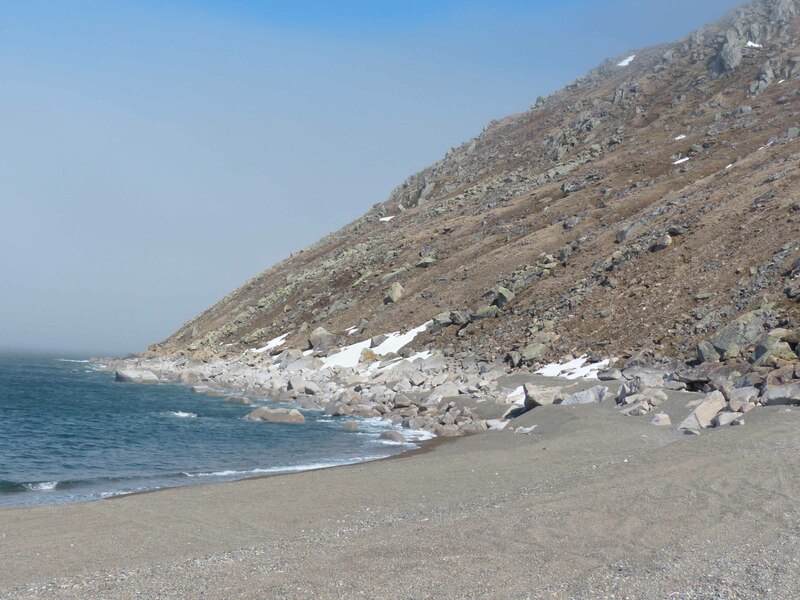 They are about a 1.5 km walk from the Inn, 2km from the Seawatch. Thank god for the ATV’s. 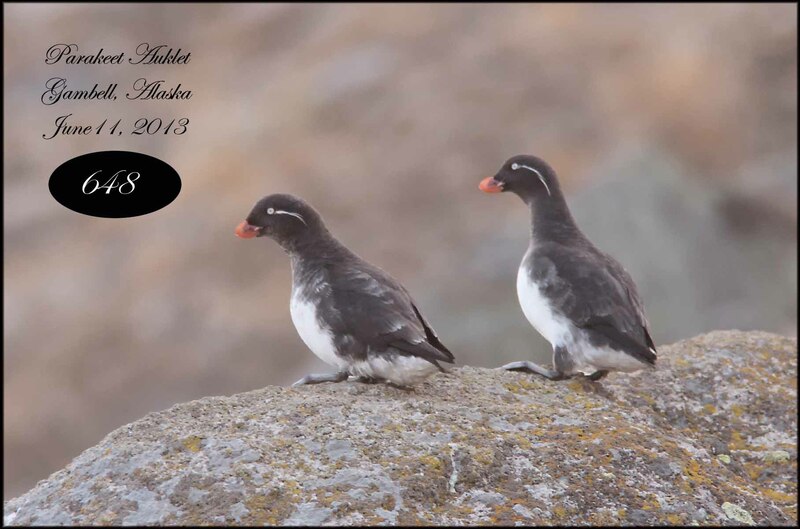 The cliffs didn’t disappoint , Least, Parakeet and Crested Auklet’s were everywhere. 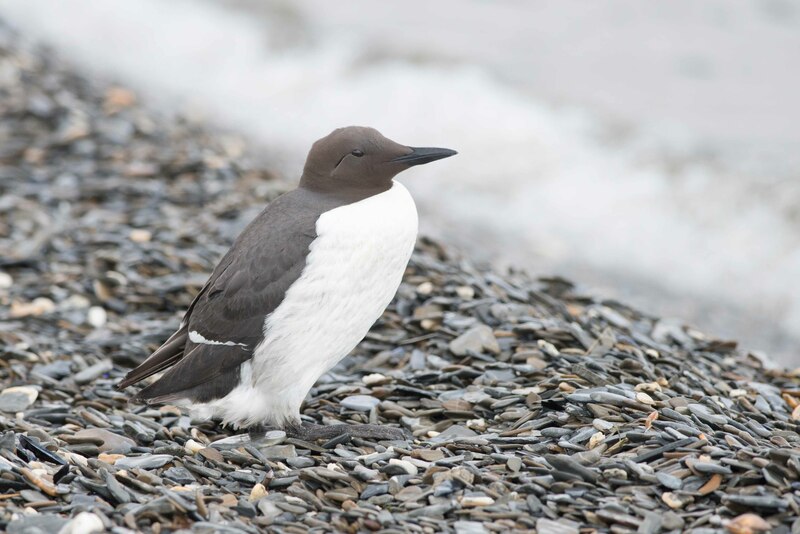 There were also great numbers of Common and Thick-billed Murre’s and both species of Guillemot’s. Every rock on that hillside, had birds perched on them. 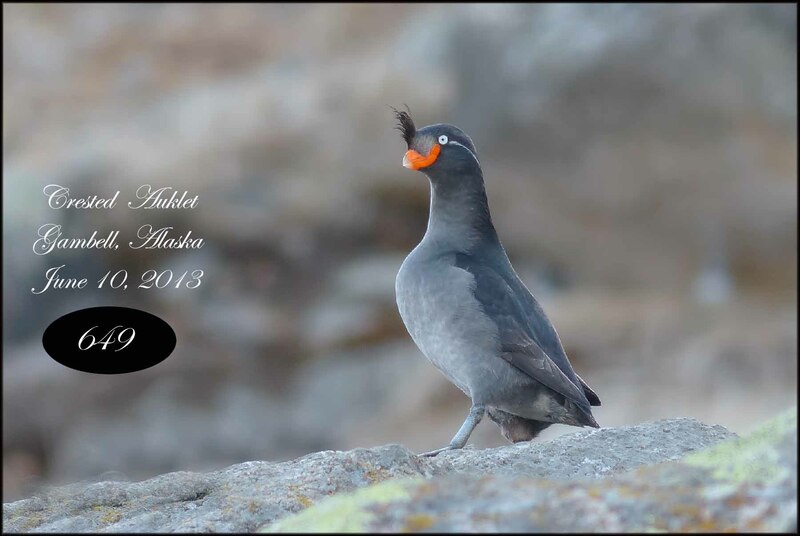 With care I was able to get to within a few yards of all 3 species of auklet. 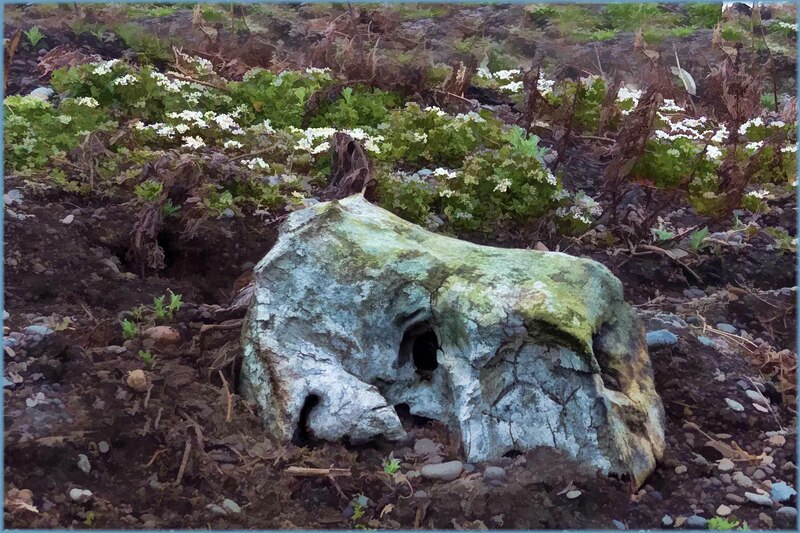 Because the cliffs and mountain are sacred to the local, caskets can still be seen on the hillside, people are not allowed to climb the rocks but there was no need, all the birds were very close and easily approached (unless the Ravens were around). Scanning an area where we’d been told 6-10 Dovekie’s could be found but are tough to spot on the cliffs, we managed to find 3 but too far for any decent images. It is a spectacle, I’ll remember for life. 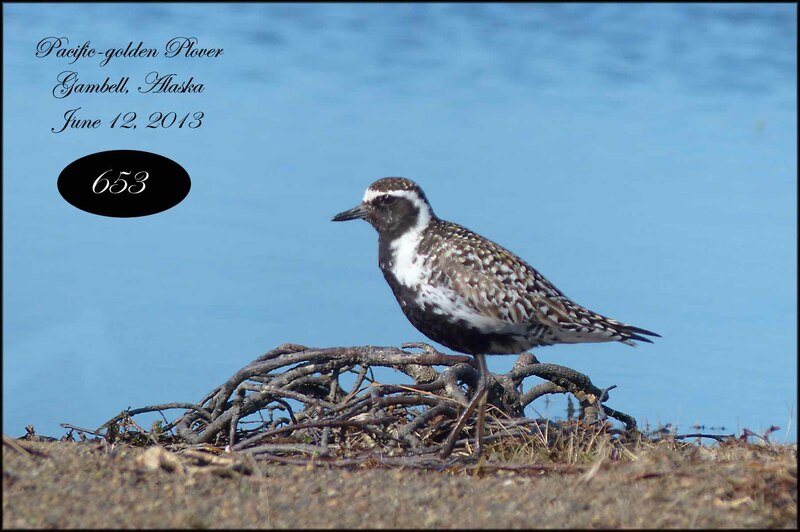 Next morning, we’d heard reports that a Common Ringed Plover, had been found, near the south end of the lake, so off we went. It didn’t take long before we started seeing Semi-palmated Plover’s everywhere. 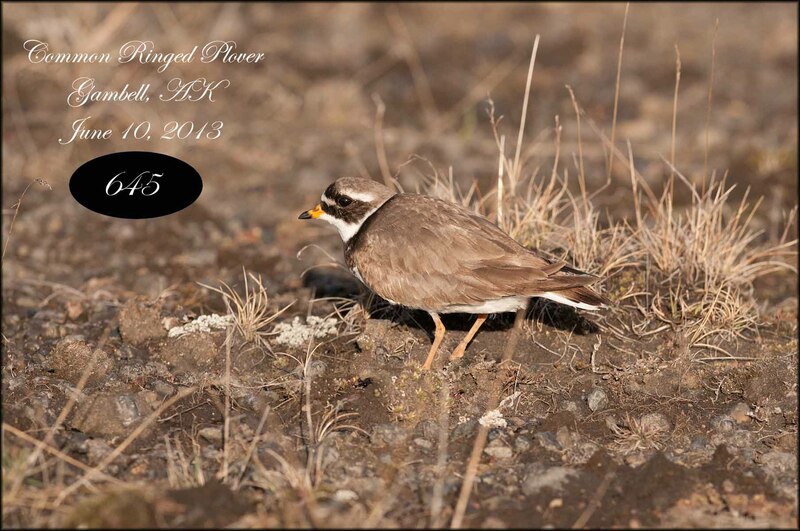 As we went from plover to plover, checking for the thicker neck band, we were finally rewarded with a Ringed Plover. Special attention to the facial marking’s, really helps with identification. 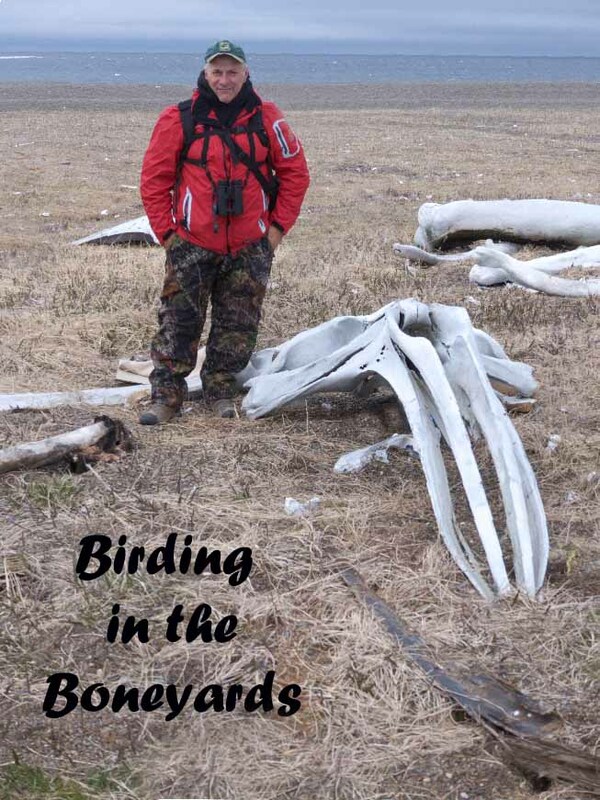 We tried all 3 boneyards and slugged through them at least twice a day for 9 days, hoping that a rarity would have taken a break there. 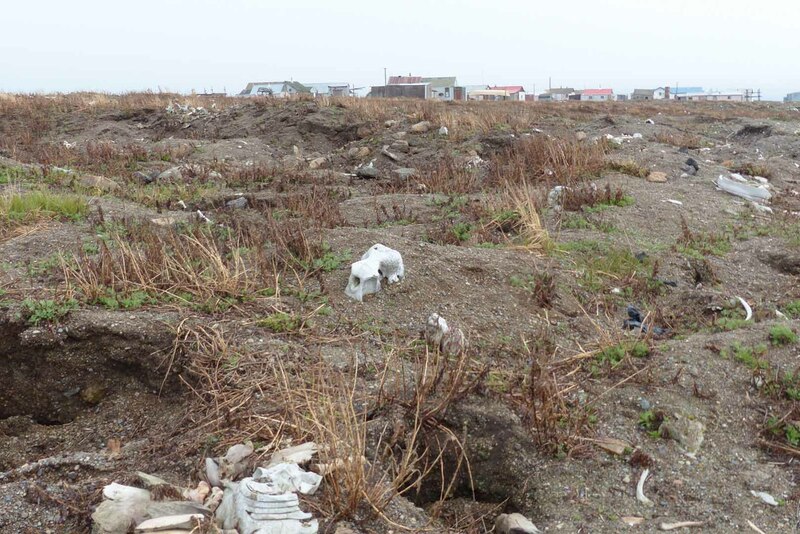 Imagine trying to walk through a mine field after all the bombs had gone off. Water, craters and loose earth, sure wasn’t my idea of fun. They did produce a few good birds. 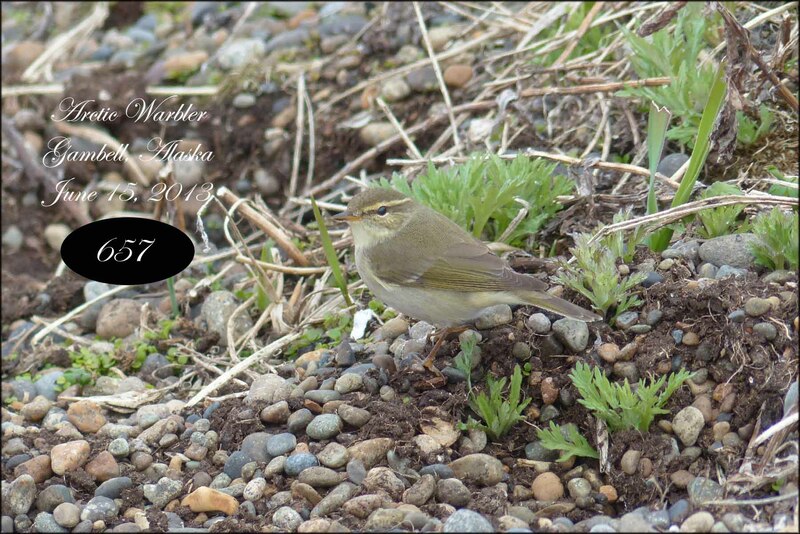 Another area was the whale boneyard, where one day we spooked an Arctic Warbler. 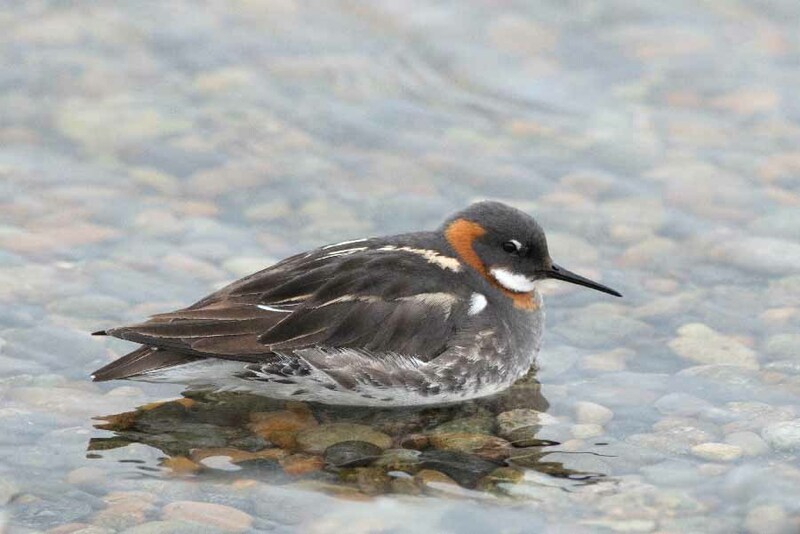 An asian species, that’s firmly established in Alaska, later in Nome I saw a many more but never really got as good a view. 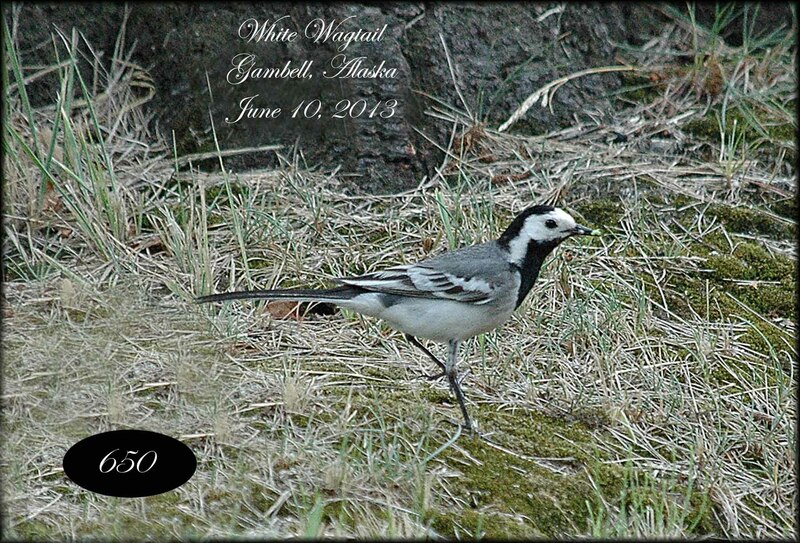 In Oldtown most days we’d see both, Yellow and White Wagtail. Another day, we found one of the wariest birds I’ve ever encountered. I saw what later proved to be a Siberian Rubythroat, 30 times, over the next 1/2 hour and just couldn’t get it in the frame. I finally got it on my Lumix FZ200, zoomed at 600mm, as it came out into the sun from under my ATV. 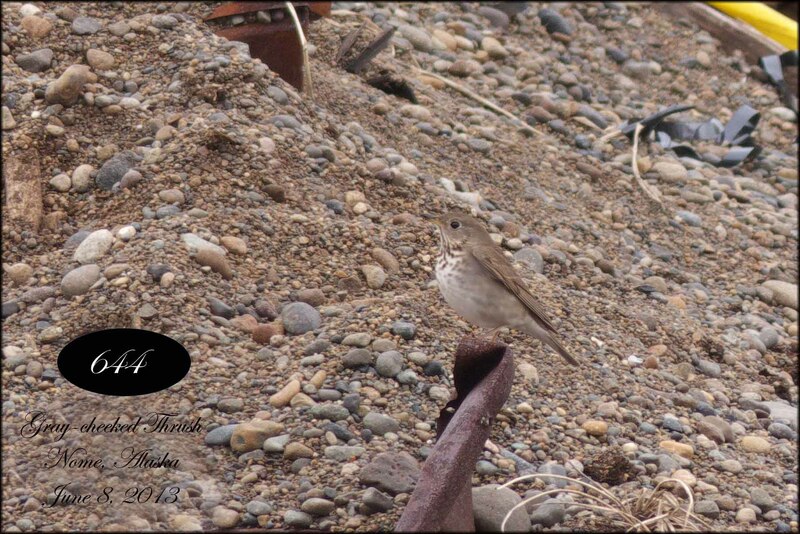 Believe me this bird was one of the toughest, I’ve ever tried to photograph. 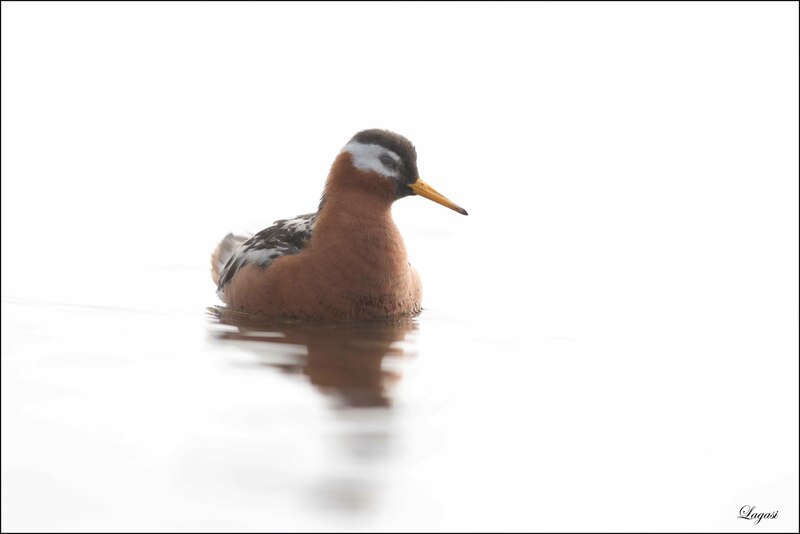 I found and photographed many new and old species: Bar-tailed Godwit, Pacific-golden Plover, Gray-cheeked Thrush, breeding plumage Lapland Longspur’s, Western Sandpiper’s, Red-necked and Red Phalarope’s. 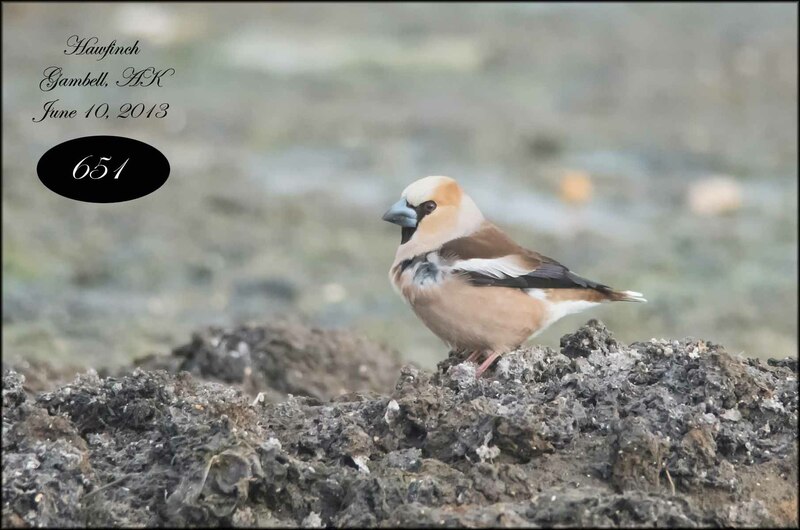 Further south there had been reports of a Hawfinch near a dried up, sewage pond. We hoped it was still in the area. For a sec, we thought it had left but then it suddenly came into view. 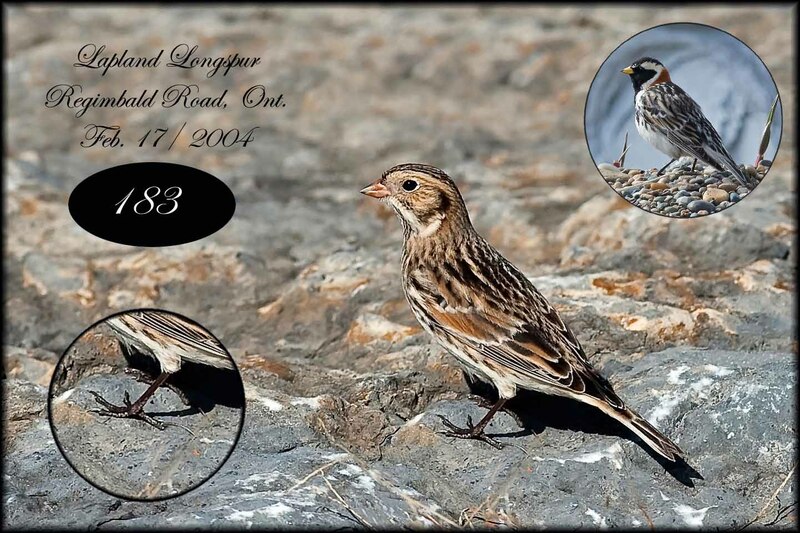 It is one of the most beautiful finches. It was a life bird for all of us. Every day we covered the same ground hoping that the winds had brought in a stray. 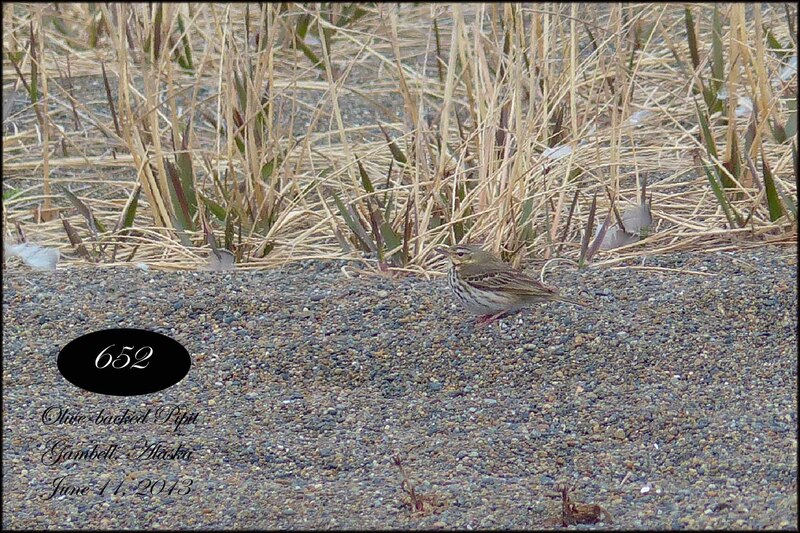 The wind that had been so favorable the first few days turned and came out of the north, halting any new bird sightings. I completely enjoyed the first 5 days on Gambell but I have to admit, I couldn’t wait to get out of there after 9 days. Maybe if there would have been more territory to cover or a few more birds but I now understand that mid-June is the tail end of migration. I can only imagine what it’s like earlier in the spring. 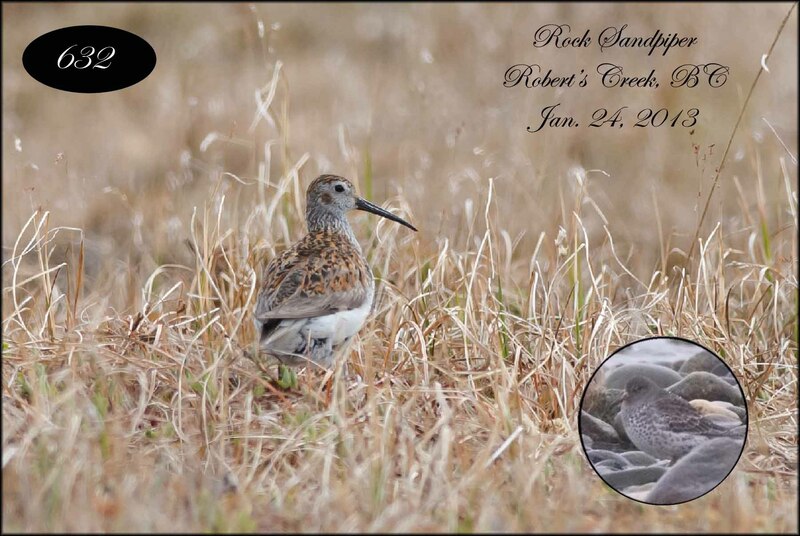 I am already thinking of going back I picked up 14 ABA life birds on Gambell, I can’t think of anywhere in North America where I’d been able to repeat this. If you plan on going to Gambell, “bring cash”, the grocery store won’t take anything else and the post office rarely had enough cash to handle traveler’s cheque’s. There is a fully equipped kitchen at the inn and you have to cook and clean, for yourself. Depending on weather (produce delivered by plane) the grocery store is stocked with some fruits and a variety of canned goods. The plane allows you two 50 pound bags, so you can buy some groceries in Nome and bring it with you. 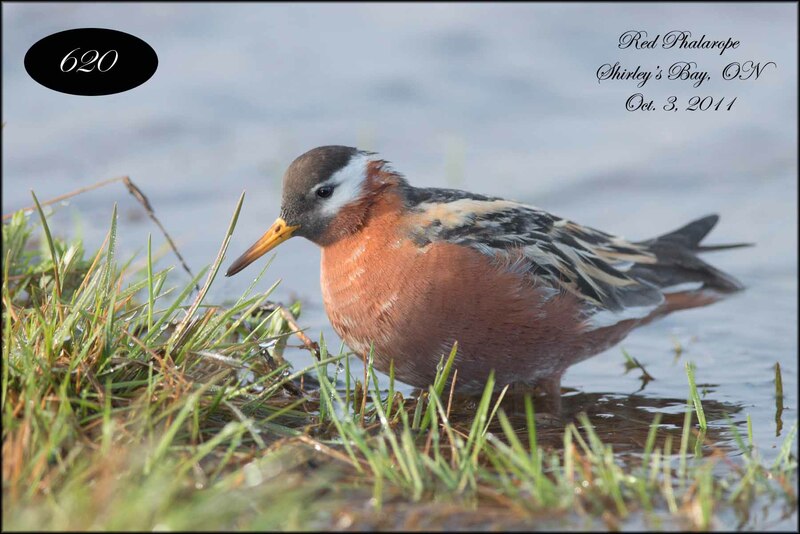 I enjoyed my 9 day stay, in Gambell but if I had it to do over again 4-5 days would have been plenty to see the common local birds. If what you’re after rarities, the longer you stay greatly improve’s your chances.